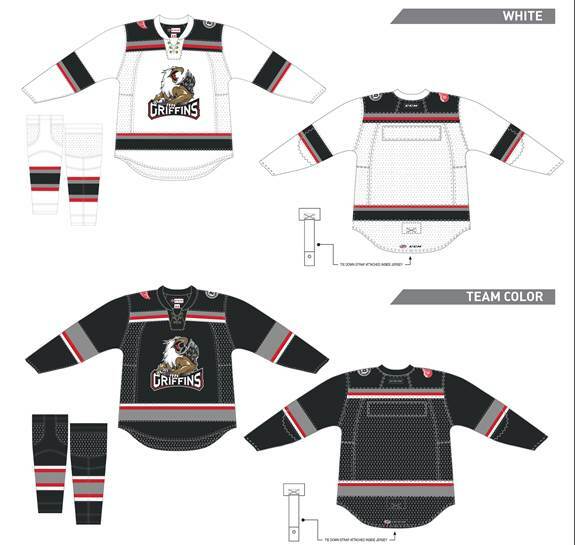 In preparation for the franchise’s twentieth season, the Grand Rapids Griffins unveiled a new logo and jerseys on Tuesday. As widely expected, the new logo is the team’s former alternate logo, which adorned the red alternate jerseys for the past three seasons. The logo has been recolored to match the team’s new color scheme of red, black, and silver. It is the first time in team history that the primary logo has been changed and is the first time that blue will not be a part of the team’s identity. With the new logo comes new jerseys featuring the updated team colors. A white jersey with black shoulders features red, silver, and black stripes on the sleeves, waist, and collarbone. The black jersey includes white, red, and silver stripes. Both jerseys feature a lace-up collar. One shoulder will have a Detroit Red Wings logo patch while the other will have the team’s 20th Season logo. The white jerseys will include an opposite-color nameplate. The team’s unique number font has been replaced by a block font. The team will also wear a yet-to-be-unveiled 20th-season alternate jersey on Friday nights, seemingly replacing their Red Wings-styled fourth jersey. I’ve been pretty vocal via Twitter about my disapproval of the Grand Rapids Griffins’ apparent logo change since it first leaked a couple weeks ago. This shouldn’t be a surprise as I’ve complained about their 20th Season logo and their choices in the “fan-designed” jersey contest last season. With that in mind, I think it’s pretty clear that my personal preferences don’t match that of the Griffins organization. That said, of course I think the expected change, to be announced on Tuesday, deserves a critique. One of my favorite things about the Griffins’ identity is that it is unique across North American professional sports. Not just the AHL (which couldn’t even avoid having two teams with the same nickname for over a decade). Not just hockey (where too many teams share names with their affiliates). All sports. That means Grand Rapids has an identity in a space they can absolutely own as their own. It’s a nearly unique opportunity. Maybe that’s why I’m so defensive of it. The current logo could be dropped next to the Florida Panthers logo or that of the Minnesota Wild and you wouldn’t be able to tell which one was the minor league team. That might not be saying much but I choose those because they’re roughly contemporaneous; you simply can’t compare a logo from the 1990s to one from the 1930s and not expect to see a difference. The Griffins’ blue, red, and gold are relatively classic colors. There’s no forced in hockey stick or puck to “show people that it’s hockey” (something the Panthers [among other NHL teams] and 13 AHL teams are guilty of). The new logo looks like something out of manga to me. The griffin is overly-muscled, with much shading used to represent this. The beak dominates his face. The eyes are red for some reason. The wings are so small as to be useless (were a Griffin an actual thing). The Grand Rapids skyline seems forced in. The team colors are almost an afterthought (and are primarily used in the wordmark anyway). The big flaw of the current logo, to me, is that the Griffins almost always use it with their wordmark attached. That’s kind of a “minor league” thing, though, as 27 of 30 AHL logos include the team name while only seven of 30 NHL logos do (and I think you could reduce it to six give that the Canucks simply arch “Vancouver” over their actual logo). With a logo that very clearly is a Griffin, it’s unnecessary to actually say “Griffins” on your jersey. Thankfully they do have a version that is just the Griffin and it does get some use. With the new logo, I don’t see how that’s possible. Taking the wordmark away gives nothing to anchor the Grand Rapids skyline. Without the skyline it becomes clear just how disembodied the Griffin is. The disembodiment is pretty unavoidable anyway, though. In the version with the wordmark, directly above the space between the N and S in “Griffins” the body of the Griffin just stops. It’s not curled around on itself or anything, it just looks like they decided to stop drawing the body and didn’t bother to hide it. Without the wordmark, that would become much clearer. 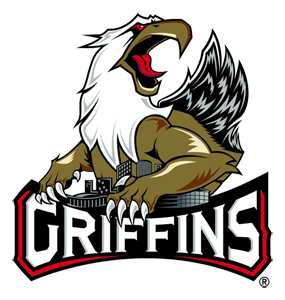 We don’t have high-quality graphics to work with yet (just the JPEG from the Griffins’ trademark filing), but here’s a look at the griffin without the wordmark. Where’s the rest of his body? To me, the new logo looks like it’s just trying to hard. It screams “minor league” in a way that the current logo doesn’t. Yes, the Griffins are a minor league team. They don’t have to look like it, though. They don’t have to change for the sake of change. I look at this new logo and I ask, “Is it better?” Not “Does it look good?” or “Does the old logo look bad?” Is the new logo better than the old one? I don’t see how it is. This logo seems to incorporate more elements from failed 1990s rebrands than the original Griffins’ logo (actually from the 1990s) does. It’s got that 90s-era extreme look to it. I don’t think it’s unfair to fear this becoming another Detroit Pistons or Philadelphia 76ers or Anaheim Angels or Houston Astros situation – where the team changed to something seemingly cooler only to change back to their classic look (or something based on it) later.